Oregon wants to hit the brakes on trains carrying dangerous crude oil through its state. Earlier this month a Union Pacific (UNP) train transporting North Dakota crude derailed and burst into flames along Oregon's picturesque Columbia River gorge. Although there were no injuries, the incident caused oil to spill into the river and the fire forced residents of Mosier, Oregon to evacuate their homes for days. Now Oregon is requesting federal regulators ban trains carrying oil in the state. Oregon's Department of Transportation asked for the moratorium in a June 8 letter to the Federal Railroad Administration. The letter noted that preliminary indications are that the Mosier derailment was caused by broken screws that were not detectable under normal inspection. Oregon is the first state to ask the U.S. for such a ban. But it's the latest blow to the oil-by-rail movement. "Carrying crude oil by rail is just not a good idea," former National Transportation Safety Board chairman Jim Hall wrote in a recent Op-Ed for The Oregonian calling for rail shipments of crude to be phased out. The Federal Railroad Administration said its investigation "remains ongoing" into the Oregon derailment. "If FRA finds that railroads need to make operational changes, we will direct them to do so," the agency said in a statement. The biggest recent oil-by-rail disaster occurred in July 2013 when 47 people were killed in Canada after a parked train rolled down a hill and exploded into the town of Lac Megantic, Quebec near the border with Maine. Rail became an increasingly popular way to transport the surge in U.S. oil production this decade especially because some pipelines have been blocked by state and federal regulators. The U.S. transported about 16 million barrels of oil by rail in March, up 1,500% since the beginning of 2010, according to the U.S. Energy Information Administration. As big as that number is, it's actually down by more than half from the peak of 36 million barrels in October 2014, when U.S. oil production began to steadily decrease after prices crashed. The recent derailments show that tank cars are often unable to survive serious incidents. That's why last year the U.S. Department of Transportation rolled out a new rule aimed at preventing accidents and limiting the damage when they do occur. The new rule includes enhanced tank car standards, requiring older tank cars carrying oil to be retrofitted, new braking standards and reduced operating speeds. The DOT rule "should result in fewer punctures and pile-ups like we saw in Oregon," the agency said in a statement to CNNMoney. However, Hall, the former NTSB chairman, argued that the new standards "still fall short in certain derailments, and even with that, many of the older cars can remain on the rails for another nine years." Hall also lamented that technology designed to prevent collisions continue to be delayed. 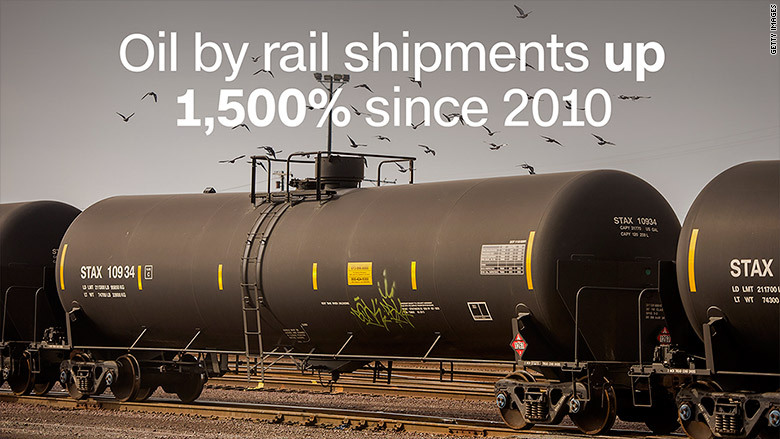 Outside of safety concerns, recent economic forces have combined to dent the popularity of shipping crude by rail. First, U.S. oil production has declined meaningfully in recent months, lowering the amount of crude that needs to be shipped. Secondly, U.S. oil prices no longer trade at a big discount to global prices. That means there's less of a cost advantage for coastal refineries to transport domestic crude (by rail or otherwise). Plus, after the U.S. ban on exporting oil was lifted, it opened up new markets overseas for crude that would normally be trapped in parts of the U.S.